Occasional musings on pubs, beer and other stuff. Arriving around 11.20 at Brighton train station, I made off immediately in the direction of the first pub of the day, The Evening Star to meet up with ,my fellow pub crawlers from the Pubs Galore Forum. We were eventually to be about twenty strong in number, and as we began to congregate at the pubs door it soon became apparent our information on opening times was incorrect. The barman came out and confirmed opening time was 12:00 and not 11:30. Cheers WhatPub. We would return, the first pub became the last. Next was The Craft Beer Co, I’ve been here a couple of times before and to be honest its not my favourite of their pubs, however after one of our number (Will) e-mailed the pub in advance to find out opening times, the managing director replied straight away and offered to open at 12.00 especially for us, they normally open at 4 pm on a Friday, a nice touch. I find it a little plain in here though there is a good choice of beer, I enjoyed Dark Star Revelation. This picture is from June 2016, It’s still the same. 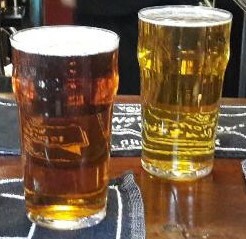 Its an interesting place, a fairly small mid- terrace pub with a good selection of cask and keg beer as well as cider. Onward to The Victory Inn, It has to be one of the best looking pubs in Brighton. Inside it’s a traditionally layed out pub, quite basic and functional , I quite liked it, but I found the beer range a little disappointing, Doom Bar, Laines Breaker Pale and Jennings Sneck Lifter, but then It may be possible I’m a beer snob. It was going to be a long day, part two follows soon. Thar said, you rarely see such a dull beer range in Brighton. How do you rate beer quality in the city ? In fact Beer of the day by some stretch was keg, more of that later. Every dog has their day. This is mine. Murders, plots, assignations, historic meetings - London's pubs are bursting with history.